Become a member for only $25 and receive Classical Journal four times a year. Apply for money to travel abroad for the summer (up to $2500!). Win $200 for the top graduate student paper at the annual meeting. High acceptance rates for abstracts. Travel the country—last year the annual meeting was in St. Louis, this year Madison. Odds are, your school will foot part of the bill. Largest regional Classics organization in North America – 31 states and 3 provinces! Up to 500 people attend the annual meeting. Opportunities to meet other graduate students and interact with professional scholars who are generous with their time and attention. Graduate student papers are on equal footing with professional. Paper sessions are hospitable and supportive. Attend a session at the annual meeting dedicated to graduate student concerns. The Graduate Student Issues Committee was established to improve outreach to graduate students. Make professional connections that can stimulate research and lead to collaboration. Get recognized for your research. Countless opportunities for professional socializing. Joining CAMWS in my first year of graduate school was an important step in my career. 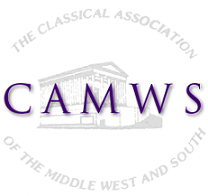 Through The Classical Journal, the CAMWS Newsletter, and the annual meeting, CAMWS helped me to feel connected to the professional world of Classics outside of my department. When I presented my first conference paper at the annual meeting that year, I did not know what to expect, but the warm, friendly atmosphere made it a pleasant experience. As I attended more of the meetings, it became clear to me that CAMWS recognizes the importance of encouraging its student members to participate in the organization. After all, students—graduate, undergraduate, and high school students—are the future of CAMWS. I’m an example: I now proudly serve on the executive committee as CAMWS’ Webmaster. I encourage all students to join CAMWS so that they can enjoy all of the benefits of belonging to this great organization. Last spring, I went to CAMWS for the first time, and I wished I'd gone earlier. The members of the panel at which I gave a paper were remarkably sympathetic and generous with suggestions for future research. I had feared the embarrassment of a battery of difficult questions, but, though the questions came, they were all asked with the clear intention of improving and helping along my fledgling project. I was much encouraged by this, and have begun to prepare my next conference paper with much less apprehension. I would certainly recommend CAMWS as a forum for graduate student papers.